Let’s start with the important stuff. That way, you can’t blame me if I write too much afterwards, as I am wont to do. First off, I made some very clear mistakes that cost me some significant time. People often write that mistakes, “cost them the win,” or “cost them a certain placing,” but racing is not static. You don’t get to say, “I lost Xmin to a penalty or Ymin to a flat or Zmin to cramping,” and then simply subtract that time from your overall time. Everyone knows this intuitively, because every athlete knows that they respond to the pressure exerted by other athletes. 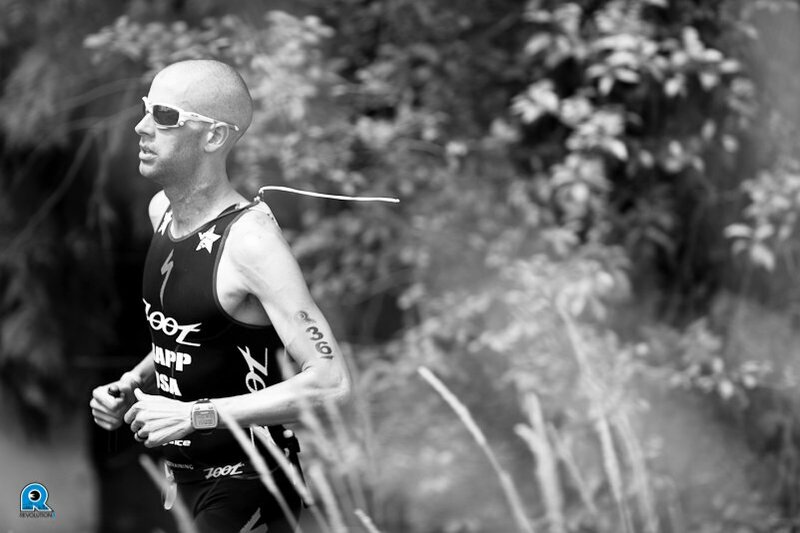 Andy Pott’s remarkable run at the recent Life Time Fitness Triathlon in Minneapolis shows that in his recent performances, where some people questioned his run, he was doing what veteran races do all the time – he did what he needed to do to win. As much as I promised to get “right into it,” I want to be clear that I’m not saying that I should have won; what I think is that I could have put myself in a better position to win the race. I could have given myself a better hand to play. Okay, since I’ve already rambled more than I promised I would, here are the two mistakes I made, which I will commit to writing as much for myself as for anyone else. 1. forgetting to bring my rubberized “speedsuit” to the race in case of a no-wetsuit swim. 2. not spending appropriate time practicing transitions; time in transition is time on the clock, and I wasn’t as efficient as I could have been in between swim/bike/run. The first was an equipment “error.” I think most people know that pros and age-group athletes have different water temperature rules for when wetsuits are and are not allowed. USAT, WTC (which runs Ironman-branded races), and the ITU all have somewhat different temperature cutoffs and rules about what you may wear in the event that wetsuits are not allowed. The relevant details in this case were that for a half-ironman distance race – 1.2mi / 1.9km – swim, USAT has set the wetsuit cutoff at 68F. In the week leading up to the race, Rev3 reported to the athletes what the Oregon Park Service reported to them – the water was 63F. The day before the race, the water was reported as being 64-65F. This would have meant that wetsuits would have been allowed. Due to some strange logistical problems, the USAT officials, who are responsible for measuring water temperature, were not present the day before the race. This race is the ONLY race in the state of Oregon that has a professional field, and as such, it requires the presence of USAT officials who have experience officiating at pro races, and the state of Oregon has none of these. So with quite a few races going on all over the US on both Saturday and Sunday, this meant that the referees for the race flew into Portland after finishing up at the Life Time Fitness race in Minneapolis. While this may seem like a lot of detail for something that was “just an equipment error,” I’m sure it’s just me trying to justify (at least partially) my own carelessness. But I also think it does point to a “glitch in the matrix.” Race morning, when the USAT officials measured the temperature in Blue Lake, they measured it at 72.8F. No wetsuits. But, under USAT rules, you are allowed to wear a rubber skinsuit (like the now-banned-by-FINA suits worn in Beijing). I have one of these suits. It’s very nice. And it’s notably faster in the water than what I bike and run in. But I left mine at home because, based on the weather forecast for Portland and the reported water temperature, the lake wasn’t going to warm up appreciably. That was a silly error. My speedsuit takes up about as much space as a pair of socks. No reason not to bring it “just in case.” And that is clearly on me. I could have – and should have – packed it. I brought a bunch of other stuff I didn’t end up using or needing, so why not that? Answer – I was careless. The (small) issue I have is that clearly the lake did not warm up by 8F+ overnight. So where was the disconnect between what Rev3, legitimately, understood to be reliable – the reported temperature as measured by the park service – and what the USAT officials measured the morning of the race? Apparently, there is no published protocol for measuring water temperature. There is not a standard thermometer. To be clear, the issue I have with this is with USAT, not with Rev3. They insist on their rules dictating an important aspect of the race, but the rules lack the legitimate under-pinning required to make it effective; there have long been accusations of USAT and race directors colluding to influence water temperature, whether it be to make swims that shouldn’t be wetsuit legal or vice versa. That always seemed a bit thin to me, but seeing now that there is not a clearly defined protocol, I see how easily it could happen. Especially since, due to logistics, USAT officials were not present the day before the race, there was literally no advanced warning that the swim would be done without wetsuits. Given a days notice, I could have rectified my forgetfulness by buying a speedsuit for the race from All3Sports, which was on-site with a good selection of gear. On race morning, some other athletes in my position attempted to scramble for a suit, but I thought that the only thing worse than not having a speedsuit would be borrowing that I’d never used before and which might not fit or which might chafe, etc. I hoped that with a good start and some harder swimming at the start, I might still be able to make it into the pack that I would have with “equipment parity.” But I did not. Now, to be clear, it’s not certain that the speedsuit would have made the difference. I still might have had a bad swim. But around the first buoy, I was very, very close to the pack that contained Michael Lovato and Jesse Thomas, both of whom (especially Michael, who I’ve raced with more often) I can and do swim with. I tried very hard to close the gap, but I couldn’t. Of course, the biggest change to make is to simply “get faster” as a swimmer; Matty Reed has no trouble making the front group in no-wetsuit swims without a speedsuit. But Matty is a much better swimmer than I am. And what that means is that I cannot afford to give up any potential advantage. Maybe some day, but not right now, and, it was clear, not on Sunday, July 10, 2011. I felt like I swam well, but I ultimately, I am relying on my personal experience that tells me, “I could have been faster in a speedsuit.”Maybe I wouldn’t have been. But I didn’t even give myself the chance to see. Now I just need to make sure I don’t make that mistake again. Okay, since I’ve already clearly violated my own promise to get the important stuff out of the way quickly and with a minimum of words, I’ll do my best to keep the details on “error #2” shorter. And, since there is really no back story, it shouldn’t be that hard, even for me. I was too slow in transition. The T1 times are quite long as there was an approximately 0.4mi run from the lake to transition. Keep in mind, when considering the fact that I was, relatively, only 4-5sec slower in T1, I also was making the transition without having to take off a speedsuit, which probably takes about 4-5seconds. So, I was probably closer to 10sec slower in T1. I can think of a few things to practice there. Most notably, I can/should figure out a way to leave my sunglasses attached to my bike so I can put them on while riding as opposed to needing to put them on in transition. A flying mount might also save me some more time, but with a saddle height of 82cm, the prospect makes me a bit nervous… In general, I will just say, “I could have been faster.” In T2, I should have grabbed my run number belt and put it on while running. Also probably could have put my glasses on while running. But mostly, I think I just need to practice putting on socks and shoes. I *can* run a 1/2 without socks. But my feet don’t seem to handle triathlon racing well, and I have run consistently faster running in socks that running without. I just need to get faster putting them on. If “4-5seconds” or, in the case of T2, 13seconds, doesn’t seem like a lot, count out “one-one-thousand, two-one-thousand, etc.” It’s a LONG time. You can do a surprising amount in 13seconds, IF YOU ARE EFFICIENT. And I was not efficient. I finished two seconds behind second and 11 seconds behind first. I know that seconds matter. Now I just need to make sure that other people are trying to figure out where they can gain time on me, rather than me looking at all the time I gave away to other folks. The race itself was relatively uneventful. I swam reasonably well, I think, but not as well as I could have. Both equipment (or lack thereof) and a lack of emphasis in the pool were responsible for that; the time in the pool (or, again, lack thereof) is a necessity of triathlon; it’s three sports. You cannot focus on all three, all the time. I have been, recently, focusing on my running, and my swimming suffered as a result. This was normal and expected, but especially in light of that, it makes it even more inexcusable to give up the other advantages available in the water. On the bike, I did a very good job of staying in the aerobars for probably 99.9% of the race and of keeping my power in my target zone for all but one stretch along the relatively rough section of roads where the extra fatigue from the rough pavement took it’s toll on the second loop. And on the run, I had my fastest ever half-ironman run; the run course, as measured by my GPS, was a bit on the short side, but even accounting for that, I still had my fastest run ever; I started my watch a bit into the run, and I got 1:14:19 for 20.60km, which would have put me on pace for a 16:07 for an exact 21.10km The course and conditions certainly set us up for a fast run, but still, I am running faster, and that’s a good thing. My previous best run came at Oceanside earlier in the year, where I was locked in a similar late push for the line, so it was nice to find some additional overall speed over a relatively similar course on a day with similar weather after a bike with similar power output. I’d also like take a moment to thank Rev3 for putting on another great race. In 2010, I had worked out an arrangement with Rev3 to do all the races in their series. After my accident, they honored my contract and found a place for me doing live coverage instead. It was a remarkable demonstration of character on their part, and I am forever grateful. While this year, as their race series has grown and my commitments have also grown, I wasn’t able to commit to doing all of their races, it was still very important to me to do at least one Rev3 race. The Portland race was the best choice as it was a qualifier for ITU LD World Championships, which, after a subpar performance at Wildflower, represented a welcome second chance to lock down my spot (which I did). The original venue was in downtown Portland, but last minute changes were required because of logistical issues with the city, and Rev3 managed to pull off this race with basically six weeks of lead time. It ended up being a very fun, very challenging (it was flat, but flat is not easy), and spectacular course along the Columbia River in the shadow of Mt. Hood. The plan for next year is to take advantage of Portland’s spectacular terrain, and I can’t wait to come back. There is a great video recap put together by Rev3 that you can find on Slowtwitch as well as a gallery of photos by Eric Wynn. In all of my focus on what I did wrong, I forgot that I also wanted to write something more positive. A year ago, I was barely training. I certainly wasn’t racing. And now I am racing for the win at competitive races. I feel incredibly fortunate. To see where I’ve come in a year is not something I want to gloss over or take lightly. I am not satisfied. But I am very happy. And thankful. [Update: 2011.07.13] For those interested in some more “useful” information, I’ve worked with FirstEndurance to keep track of some nutritional information. You can find those details on the FirstEndurance.com blog. Awesome. Keep on writing long, bro. Your races should be a competition to finish first – but for your Race Reports there's no such goal. Very close Race for a 1/2 IM. One of the closest I have seen. You were certainly equal to the best there. A speed suit, (now I have to get one) or 12 seconds in transition could have put you on top. Great video and B+W pics of the course and competitors. As usual, compared to others in general, you look very much at home on the bike. Do you have a more relaxed position now, as opposed to a few years ago in IMAZ on the Felt? (you looked at home there too!) That is an issue I think about, without the benefit of a wind tunnel, how agressive to ride for a sprint. Position hasn't changed at all since April 2008 IMAZ. In November 2008 IMAZ, I rode with 8mm more spacers than in April, but since then I've never changed anything. Even as I've ridden two more bikes – Specialized Transition and Shiv – position has stayed identical. Love reading race reports! Inspiring stuff. Thanks Jordan. Always expect the unexpected especially in weather, sports and investments. Modified from Albert Hettinger Jr's life experience.